I had a craving for cake — which is never a surprise. Then cake became brownies. Brownies, chocolate. Chocolate, popcorn. Popcorn, cheese. And cheese, pizza. 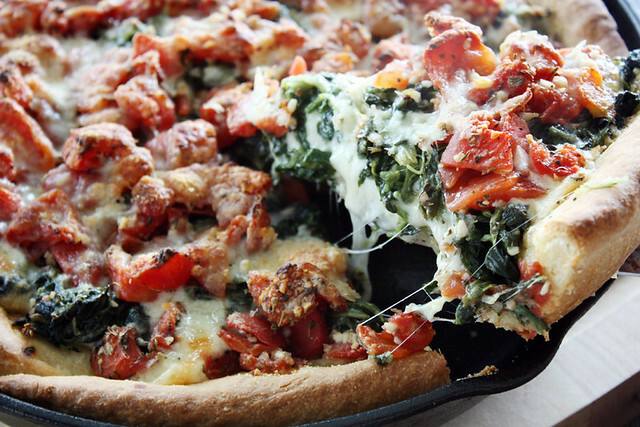 I finally landed on this deep dish pizza. And my cravings for the next millennia surely will include some form of this (my skinny jeans already are cowering in fear). I had a craving for homemade pizza crust, soft and buttery on the inside and crusty and crisp on the outside. 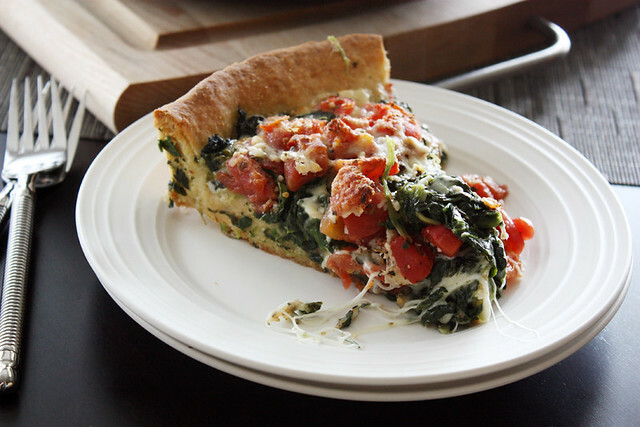 A crust topped with fresh chopped tomatoes, a generous handful of cooked greens, enough garlic to clear my nose and a drizzling of olive oil. And cheese. Always cheese. I had a craving for something fresh and hearty, warm and comforting, unique and easy. Something to share (if I’m feeling nice). Something to make over and over and over again for many dinners to come. I had a craving to make this for me and my husband, backlit by a row of candles and a setting sun, accompanied by good conversation (and popcorn for dessert*). And so, I did just that. This pizza will be making many returns to our weekly menu. It was easier to make than I expected — so easy, in fact, that I’d even consider it a weeknight dish. The flavors were complementary, not competing; the preparation simple and straightforward; the end result, perfection. 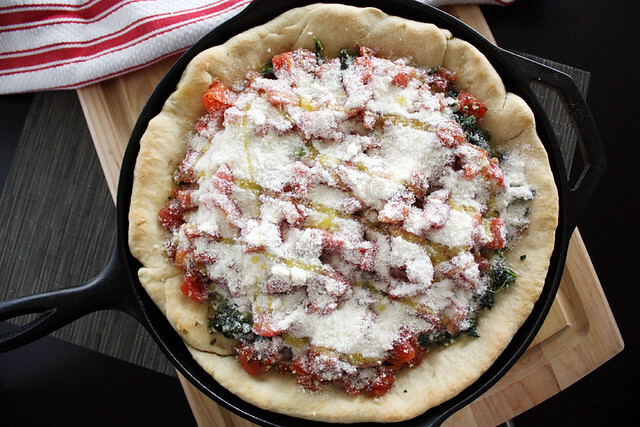 I baked it in a cast-iron pan as opposed to a deep dish pizza pan per the original recipe’s request, so I suppose this is considered more a pan pizza than a deep dish one, but nevertheless: It’s worth what little effort it requires. And, as evidenced above, able to cure most cravings. *Like I said, MOST cravings. This girl loves her popcorn. And cake. In a large bowl or bowl of a stand mixer, combine flour, cornmeal, yeast, salt, olive oil, melted butter, vegetable oil and water. Stir to combine. Knead by hand or in stand mixer on medium-low speed for 7-10 minutes or until soft, smooth and elastic. Shape into a ball and place in a lightly greased bowl. Cover and let rise until nearly doubled, about 1 hour. When dough is nearly ready, prepare the pan: Coat the bottom and sides of a 12-inch cast-iron pan or 2 9-inch round cake pans with 3-4 tablespoons olive oil. Preheat oven to 425 degrees F.
Punch down risen dough and remove from bowl. Stretch dough into a circle large enough to cover the bottom and almost all the way up the sides of your prepared pan. Press dough evenly into pan. Cover pan with a tea towel and let dough rest 15 minutes while oven heats. When dough has rested and oven is ready, place pan in oven and bake 10 minutes, or until crust is set and barely turning brown. Meanwhile, make the filling: In a large bowl, combine tomatoes, minced garlic, sugar, Italian seasoning and salt and pepper to taste. 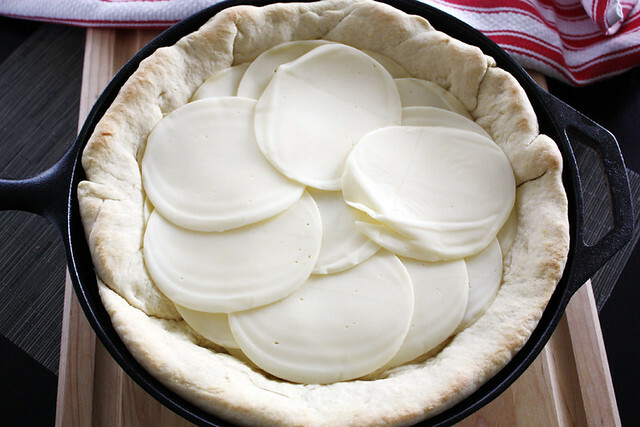 When crust is set, remove from oven and cover bottom evenly with sliced provolone cheese. Top with chopped spinach, then with tomato mixture. 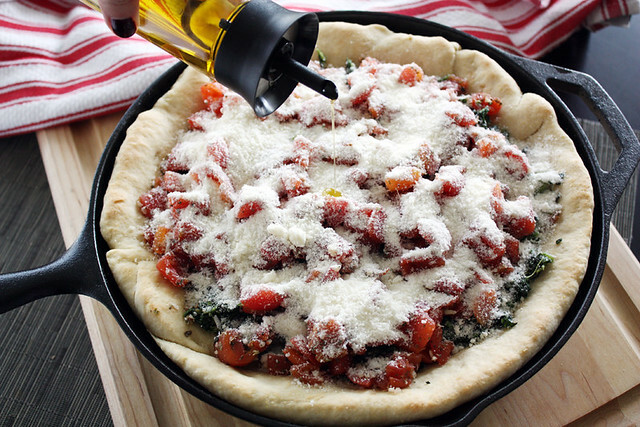 Sprinkle with Parmesan cheese and drizzle lightly with olive oil, if desired. Return pan to oven and bake until filling is bubbling and crust is a deep golden brown, about 25-30 minutes. Remove from oven and cool at least 15 minutes before slicing. Serve warm. This looks amazing! I love homemade pizza dough but rarely make it. 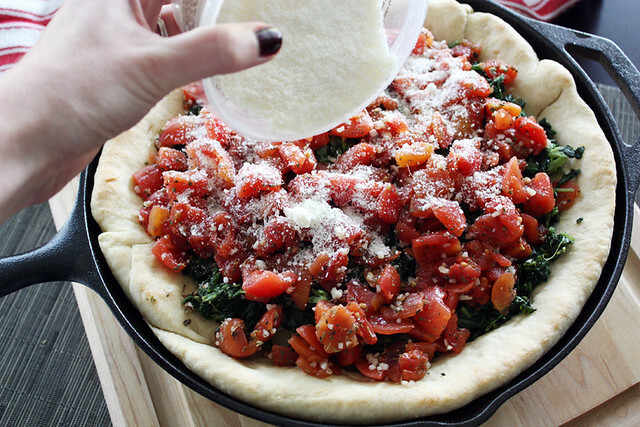 I also love the ingredients you chose for the filling – you can never have too much garlic!! Jenna — Thank you! And it’s true: Garlic is my BFF4EVR (until I smell like garlic for the next 4 days straight ;)). Omggggg. This is by far the most decadent thing I’ve seen all day!!! You have me drooling. I’ve been working up a craving for thai all this week since we’re going for thai tonight, but that means I’ve been having to stamp down my pizza craving all the while. This is not helping!! Also I am so excited. I have a 2.5-lb. bag of spinach that I have not yet touched. 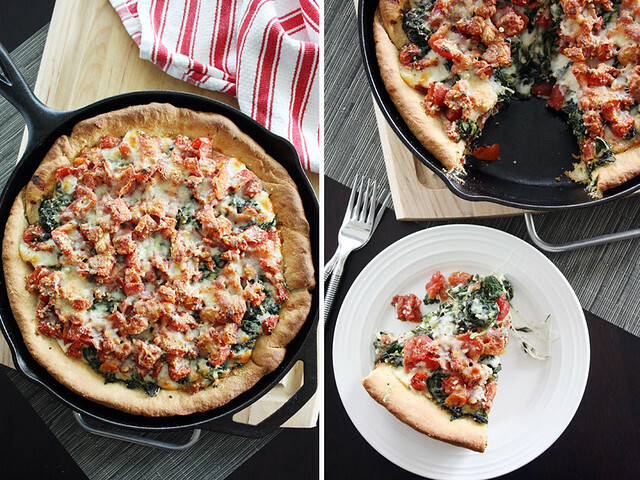 I think this pizza and your chevre, onion and spinach stuffed rolls might be the perfect way to make a dent in it!!!!! Erika — And now I want Thai food, LOL! 🙂 And yay for using up that bag o’ spinach… hope you like the recipes! Erika — I got the pan for Christmas so I’m not sure exactly where it came from, but it’s a 12-inch Lodge cast-iron pan (pre-seasoned). It’s totally worth the price; I use it for everything. Pingback: Pin #4: Popeye’s Pizza | What Number's In Your Bucket? Can I use fresh spinach and if so, would I need to cook it first? I can’t wait to try this. Thank you! Marla — Yes, you can definitely use fresh spinach, but you will need to cook it first. Enjoy! Could I use already made pizza dough if I was in a rush? I made this tonight and it was so delicious! I was a wee bit lazy and bought frozen pizza dough at Kroger. I brushed it with butter to make it a little more authentic. Really yummy! Thanks for the recipe! 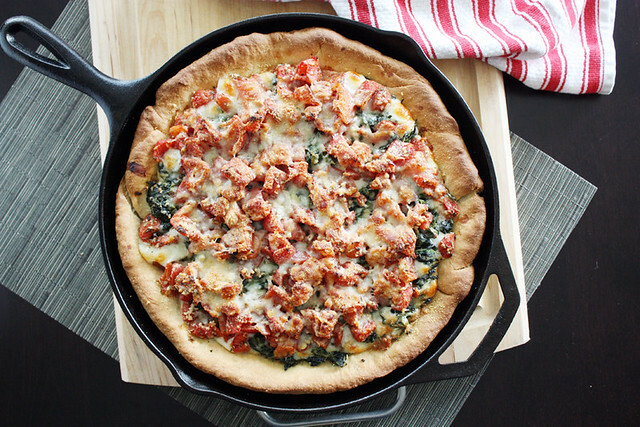 We love this pizza and I make it at least once a month now. I use fresh spinach but that’s my only change that I make. Perfection!